Central Illinois residents on Monday continued assessing damage from rare December tornadoes, including a half-mile-wide one that injured at least 20 people. The state’s severe weather was part of a line of thunderstorms that raked areas of the central U.S. late Friday and into Saturday, killing one person in Missouri. The National Weather Service confirmed tornadoes in Illinois, Missouri and Oklahoma. And in Arkansas, at least three tornadoes that largely caused property and structural damage were confirmed in the northwest and southwest parts of the state. Peak months for tornadoes in much of the Midwest are April and June, according to the weather service. But at least 23 tornado touchdowns on Saturday have been confirmed in Illinois, said Dan Smith, a meteorologist with the weather service’s Lincoln, Illinois, office. That was the most tornadoes in Illinois during a December storm since a Dec. 18-19, 1957, outbreak produced 21, Smith said Monday afternoon. He said that number may grow because crews continue surveying three other sites to determine if storm damage there was also caused by tornadoes. The weather service sent crews Sunday to survey the hardest-hit areas in Illinois, which included Taylorville, 25 miles (40 kilometers) southeast of Springfield. A survey showed that storm produced estimated peak winds of 155 mph (249 kilometers per hour). The tornado was on the ground for around 10 miles (16 kilometers) before it thundered through Taylorville, and the weather service was able to warn residents of its arrival 41 minutes before it actually struck, Chris Miller, a meteorologist at the service’s Lincoln office, said Sunday. That advanced warning gave people critical time to take cover and may have saved lives. A Taylorville Memorial Hospital spokesman said 21 people, ages 9 to 97, arrived for treatment Saturday. Most were released within hours. Miller said three people remained hospitalized as of Sunday afternoon. Illinois Gov. 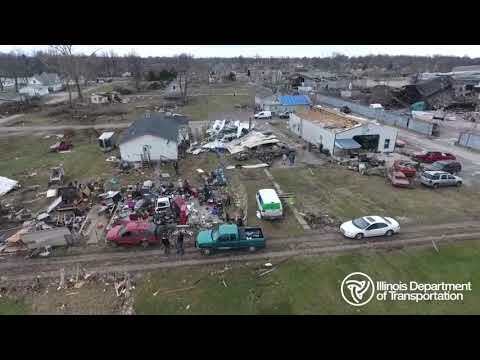 Bruce Rauner declared Christian County, where Taylorville is located, a state disaster area, which makes various state resources that can help it recover available. Early Saturday a third tornado with estimated peak winds of 107 mph traveled about 8.5 miles (13.5 kilometers) through Spring Hill in southwest Arkansas. Its path was intermittent and mostly caused damage to trees and some structures. Associated Press writer Hannah Grabenstein in Little Rock, Arkansas, also contributed to this report.